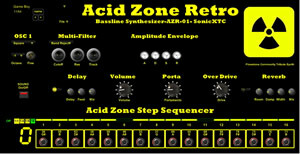 SonicXTC releases Acid Zone Retro, a free for download Vintage Synthesizer VST for Windows. This freeware plugin is a monophonic single oscillator synthesizer, that is designed to harken back to the DIY analog synths of the past. AZR-01 has all the synthesis programming parameters available on the front panel. It comes with 32 presets to get a user started. New freeware 5 oscillator synthesizer, Trance Zone Retro LE, is a recreation of those old classic synthesizers that brought the “Super Saw” sound to the dance floor. Like Deep Mono, Deep Step-606, and AZR-01, TZR-01 is simple to program and has all the synth programming parameters on the front panel. Tweak a knob and you immediately begin to sculpt the sound. It comes with 16 presets to get you started down the Super Saw path! The sequencer included in AZR-01 was derived from reviewing the many sequencer schematics available on the open Flowstone/Synthmaker community forum. We made our own proprietary modifications, but wish to thank all the developers for sharing their groundbreaking work. You can download this free plugin using links listed bellow.